Jul 26 Book Review: "Where I Find Myself"
Born in 1938, Meyerowitz spent a majority of his time wandering the streets of New York City. He became fond of photography after a shoot with Robert Frank, realizing that the simplest movements have great potential for expression. With his photography, Meyerowitz seeks out the glamorous within a mundane environment, striving to prove that there’s merit wherever one looks. “Where I Find Myself” encompasses Meyerowitz’s career, showing where he has traveled, the various techniques he’s experimented with, and the many wonders he discovered along the way. He has dabbled with black and white versus color, traced the footsteps of the very man who inspired him, Robert Frank, ventured the debris of Ground Zero, and tons more. As you browse his book, while all but a few of his projects lack pose, it is clear Meyerowitz has a trained eye. Effortlessly, he hones in on the spectacular and snaps a picture before the moment breaks apart. Most importantly, he broadcasts that even the ordinary yields a dazzling quality. 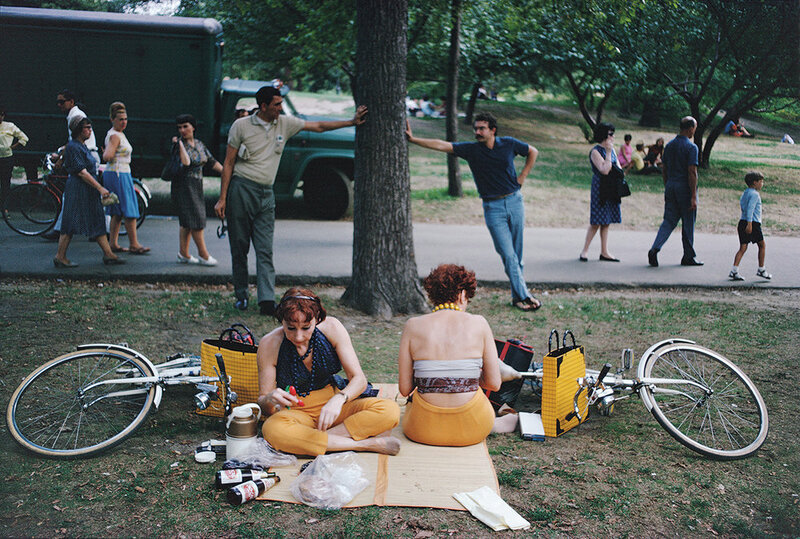 For instance, there is a simple photograph where a duo of redheaded women sits comfortably at a park, but in reality, the picture is teeming with parallelism. The ladies both wear yellow pants, identical checkered purses and bicycles propped beside them. In the background, two men, leaning on opposite sides of a tree trunk, share a casual conversation. Even further, there are groups of individuals ambling down a beaten path, engrossed in their personal business. There is something fascinating about uncovering these corresponding elements—this elemental balance that one would’ve missed had they not absorbed this exact instant. That’s the genius of Meyerowitz’s work: he begs the viewer to gaze longer—to scrutinize a little more closely—to find the true masterpiece. A set doesn’t have to physically be arranged to create an enchanting, evoking atmosphere. 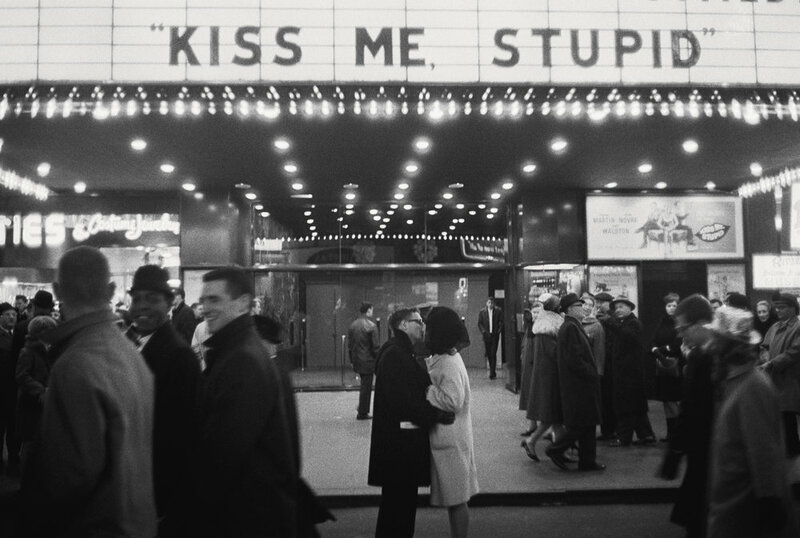 In one picture, Meyerowitz captures a couple locking lips in front of a movie theater. Ironically, they are situated below a sign that says “Kiss Me, Stupid,” thus metamorphosing this moment from the typical display of affection. In another image, he catches the millisecond a swimmer launches out of a pool. But is she emerging from the pool… or diving into it? Meyerowitz wants the viewer to work to unveil the enigmas of his projects. There are other notable events Meyerowitz managed to immortalize with his quick fingers and keen sense for aesthetics. Women in their beachwear, seemingly standing in the middle of an ocean, a soft horizon as their backdrop. A man breathing out a fervid fire as onlookers stroll by. A crowd of firefighters and police in front of the Twin Towers, demolished after 9/11, as smoke ascends from the rubble and smothers the night sky. Meyerowitz emphasizes that our world is a piece of art. Consisting of many people and objects, when they interact—when they collide—occasions of beauty and brilliance come into existence. His work illustrates that the world repeatedly produces riches, and to discover them, one must stop rushing. Linger. Embrace every little thing. With “Where I Find Myself,” Meyerowitz denotes how he became the ultimate master of photography: by always looking exclusively rather than inclusively.